happy New year everyone.My first card of the year and my first ever digi image bought from Mo's Digital Pencil Too. 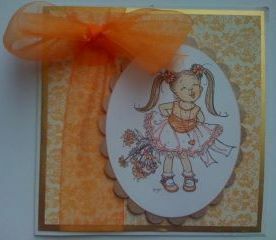 Orange is one of my fav colours, and I have to agree with your freind on fb, wide ribbons look fab on the cards. I'll have to steal your idea of making the card before you colour the image! Might save me a bit of time. It's fab lyn she looks as cheekie as Katie!